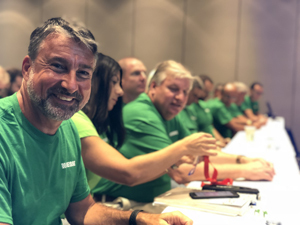 Biesse is proud to announce that IWF 2018, held August 22 to 25 in Atlanta GA, was another record-setting performance for Biesse America and Biesse Canada, even exceeding our expectations, with approximately $20 million USD of duly signed orders, making this our most successful show ever in North America. 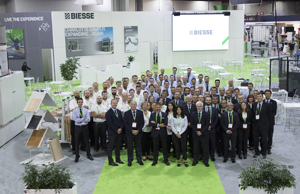 With over 27,000sqft of booth space, packed with innovative technology, Biesse welcomed more than 1,400 companies in Atlanta. With the largest booth at IWF, Biesse was able to showcase a wide range of machinery, including integrated robotics and automated solutions to meet all levels of manufacturing needs. ”Automaction was the major theme for Biesse heading into this year’s show. The technology we presented at IWF allowed attendees to see how our machinery addressed the challenge of finding labor with today’s record level unemployement rates in North America, as well as offering solutions for increased and consistent productivity,” said Federico Broccoli, Biesse America and Biesse Canada President/CEO. “In the 12 months prior to IWF, Biesse had an order intake exceeding $50 million USD in integrated lines and is a recognized leader and solid, experienced and reliable partner in the high technology systems market.” Brocolli added further. Another attention getter from IWF was Biesse’s SOPHIA IoT platform. Attendees were able to experience first hand how this innovative technology provides a comprehensive overview of specific machine performance features with remote diagnostics, continuous updated statistics and full integration with our new PARTS Portal. We demonstrated how the portal makes it faster and easier for customers to purchase parts, check availability and track purchases online 24/7. “Biesse strongly believes that our products should be supported by high quality services and we continuously invest in research and development,” said Broccoli. “With SOPHIA and our new PARTS Portal, we have become more predictive of our customers’ needs and are able to anticipate requirements for support. It is the right vision and we are strongly committed to following the path of providing the best Industrial IoT solution and platform to our customers to give them the competitive advantage. The feedback has been excellent, rewarding all of our efforts because SOPHIA is a real added value.” Brocolli concluded. The company’s success at IWF continued a very strong trend for Biesse in the North American market where Biesse America and Biesse Canada are registering record order entrance, with a solid backlog for 2019. At our annual VIP/Make-A-Wish party on Thursday, August 23rd, Biesse continued its longstanding tradition of giving back to the community by presenting a check of $12,000 to Make-A-Wish during Thursday night’s VIP/Make-a-Wish party at IWF. Honored to host over 800 people at the event, Biesse doubled the amount of its initial check from $6,000 to $12,000. This already ensures that two wishes will be granted to children with life threatening illnesses. “It is extremely satisfying to see the North American market and our subsidiaries growing so steadily. Biesse has always been, and will remain, dedicated to America and Canada and those tangible signs demonstrate our determination to continue this commitment to North America,” said Broccoli.